Have you ever imagined what it would be like to ride a bicycle across the Scandinavian country of Sweden? In this new video series from Bicycle Touring Pro you’ll get the opportunity to see what it’s like to travel by bike across one of the flattest, most bike-friendly and most beautiful countries in the world – SWEDEN! Follow along as the Bicycle Touring Pro himself (Darren Alff) goes cycling in Sweden and rides his specialized touring bicycle from Copenhagen, Denmark to Oslo, Norway – accompanied by his Spanish friends, Pablo and Ana (of www.bikecanine.com) and their dog Hippie. The videos are arranged on this page in chronological order – from top to bottom. So start with the first video below and then work your way down. 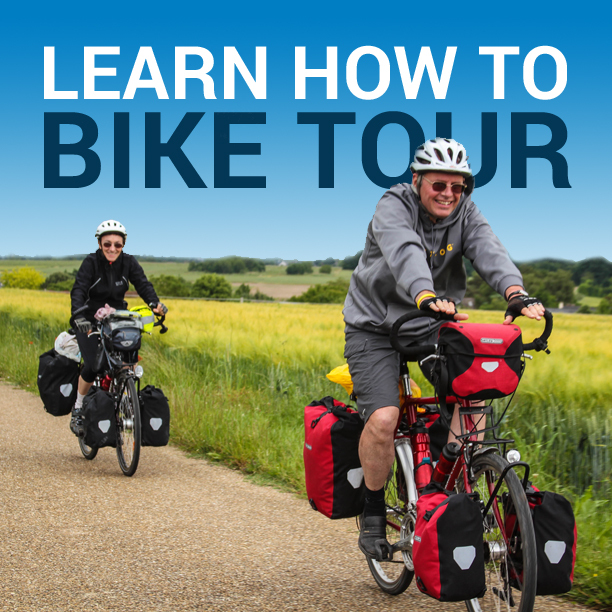 Have fun following the Bicycle Touring Pro as he goes cycling in Denmark, Sweden and Norway! After spending a day in the capital city of Denmark, Darren returns to his campsite and is greeted by Pablo and Ana and their dog Hippie. The young couple spend the night in the campsite and then invites Darren to join them on their bike tour north toward the Scandinavian city of Oslo, Norway. After packing up their tent and bicycles, Pablo, Ana, Darren and Hippie (the dog) cycle north out of Copenhagen, Denmark and visit a friend of Pablo and Ana’s in a nearby city. Then the trio continues their bicycle tour by taking a ferry across the water and cycling in Sweden. Sweden is flat, which is great for bicycle touring (or cycling of any type), but the fact that it’s flat also makes the country vulnerable to wind. During their first full day in the country, Darren, Pablo, Ana and Hippie encounter a fair amount of rain and wind, making the riding a bit more difficult than any of them had expected. In this video, you get to meet Pablo and Ana and their dog Hippie and hear about their incredible bicycle touring adventures in Europe. Then, Darren, Pablo and Ana jump on their bicycles and continue pedaling north along the Swedish coastline. Here’s your chance to see what it’s like to cycling in Sweden! Traveling in Sweden can be expensive, but not when you travel on the back of a bicycle, learn to camp for free, collect water from local churches and eat on a budget. In this video you’ll get a behind-the-scenes look at the lives of three inspiring bicycle travelers as they go cycling in Sweden. Pablo and Ana are an amazing young couple from northern Spain who have cycled across Europe with their friendly dog Hippie. On most days, Hippie rides in a large basket mounted to the back of Pablo’s Surly Big Dummy touring bicycle. But on uphills, Hippie jumps out and runs alongside Pablo on his loaded touring bike. After a night camping on the edge of a small lake, Pablo, Ana, Darren and Hippie (the dog) cycle to the nearby town of Gothenburg, Sweden, where they meet up with one of Ana’s friends from Spain. her friend invites them into her home, gives them a place to sleep for the night, and lets them take a much-needed shower. 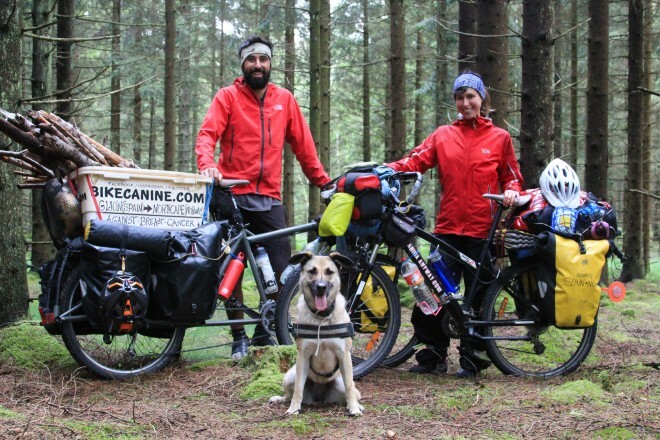 After saying goodbye to Pablo and Ana and their dog Hippie, Darren continues cycling in Sweden – north toward Oslo, Norway and all on his own. It takes Darren a while to get back into the groove again and remember what it’s like to cycle by himself, but it doesn’t take long for his bicycle touring roots to grow back. He spends the night camping in a beautiful, green forest on a small island in western Sweden. Darren is woken up in the middle of the night by a large deer charging at his tent, barking and making all sorts of noise. After a restless night of wild camping in the Swedish forests, Darren continues his bicycle touring adventure and continues biking north toward Oslo, Norway. When you travel by bicycle for days, weeks or months on end, you have a lot of time to just sit and think. In this episode of the Bicycle Touring Pro travel vlog series, Darren Alff explains how he keeps himself entertained while on his bike tours, and talks about some of the things he thinks about. It took just over a week to cycle from Copenhagen, Denmark to the border or Sweden and Norway. Darren has spent more than 15 years bicycle touring across dozens of countries all around the world, but he’s fearful about arriving in Norway, only because of how expensive he heard it was to travel there. Luckily, after a short amount of time, he discovers that Norway isn’t nearly as bad as everyone has made it out to be. During Darren’s last full day of biking in Norway before meeting his friend Eric Kiraly in Oslo, Norway, he cycled north through a beautiful, green forest region, then camps in the woods for one more night – picking wild blueberries for dessert. Finally, Darren Alff (the Bicycle Touring Pro) arrives in Oslo, Norway. He cycles to the train station and buys a ticket to the west-coast city of Bergen and then waits for several hours before his friend Eric Kiraly arrives and they both jump on a train together – traveling to Bergen, Norway for the start of their self-guided bicycle tour with Active-Norway.com. NOW IT’S YOUR TURN: If you want to learn how to conduct your own incredible bicycle touring adventures (like you see Darren, Pablo and Ana doing in these videos), be sure to visit the website at www.bicycletouringbook.com and pick up a copy of The Bicycle Touring Blueprint – the world’s best bicycle touring handbook (a book that is responsible for helping thousands of people all around the world learn how to conduct their own bicycle tours). This entry was posted in Bicycle Touring Pro Articles, Darren Alff's Bike Tour Blog, Denmark, Europe, Featured Articles, Locations, Main Articles, Sweden, Videos and tagged bicycle touring in sweden, bicycle touring pro youtube channel, bike tour in sweden, bike trails for dog, biking with a dog, cycling with a dog, darren alff, hippie, how to bike tour with a dog, pablo and ana, scandinavia, sweden, sweden bike tour, sweden cycle tour, sweden tv show, sweden video series.